I just started buying Graphic 45 paper, ephemera, chipboard tags & embellishments a couple years ago. I don’t get all that they come out with, only the ones that really appeal to me. 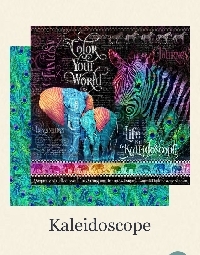 Just like the Winter 2019 set Kaleidoscope! That is it in picture. Oh my goodness the colors are amazing!! I can’t wait to create something with it! So let’s make some ATC’s with whatever Graphic 45 paper & embellishments you have. You can use inks, other bling, ribbon or whatever you think it needs. But 95% of ATC must be Graphic 45 paper & ephemera. So pull out your Graphic 45 paper & goodies and create something beautiful for your partners!